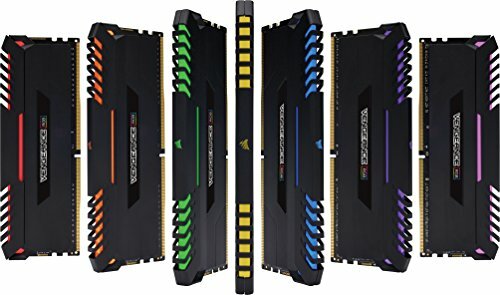 $3766.42+ "Merc with a Mouth Final"
Update: Do not buy any Corsair Vengeance for use with the Raven Ridge APU. The Dominator is on the QVL, this is not. It's great RAM and it's actually Samsung B-Die, but it's not compatible. Moving rating from 5 to 4 stars. Original: This RAM is also an overkill for the 2400G. While it's possible to get better performance with faster memory. In practice above 3200 RAM, the CAS speeds begin to decline meaning that the combined speed is about the same. Unfortunately, I was not able to find stability clocking this ram to anything greater than 3200 without a BSOD, probably related to the fact that this RAM was not on the official QVL list for the board, or the fact that officially the front side bus for the APU doesn't really support anything above ~2900. However, I was also able to set the CAS down to 14 which speaks again to the idea that overall combination of frequency and CAS are related. From a price perspective, 3200 14 CAS is actually more expensive today. To really maximize an APU like the 2400G or 2200G though, you really need decently fast ram. Unfortunately with current sky-high RAM prices, this flies in the face of the affordability. However since my longer term goal includes more aggressive CPU and potentially higher workloads, splashing on good RAM makes sense. Running at 3200 CL14 timings due stability issues while using Aida 64.